In the summer of 2005, I began having headaches. Bad, unrelenting headaches. When I went to see a specialist, he was not too worried about the headaches, but he was concerned about my increasing loss of hearing on my left side. I assured him that this was not a problem for me. I wasn't overly concerned. I was familiar with deafness, since it runs in my family. But the specialist did some odd tests, such as checking the feeling on my face, having me stand on one foot with my eyes shut and asking me to walk heel-to-toe in a straight line. After seeing me tip over like a drunkard on the last two exercises, he ordered a CAT scan followed by an MRI. As it turned out, my headaches were just another really bad sinus attack (for which surgery could be done, but was not essential), but something much more serious showed up. After the results were in, the doctor had me come and see him again. He told me straight up that I had a benign brain tumor called an acoustic neuroma. Female human brain, side view. My first question was, “Are you absolutely sure it's not cancer?” and he said it definitely was not. But he went on to say that it could cause other symptoms, including a loss of feeling on one side of my face, the unilateral hearing loss I had been experiencing, ringing in that ear (tinnitis) and vertigo. My tinnitis was more like a buzzing that never quit, and not loud enough at that time to be a bother, but the vertigo was a new symptom that had begun just a few months earlier. I had no idea they were all related. Since they tend to grow slowly, acoustic neuromas often cause few problems, but if they put on an unexpected growth spurt, they can cause death by compressing the brain. My options were to wait and see what happened and have annual MRIs, or have it treated with radiation or have it physically removed. While I was shocked by the diagnosis, I was also relieved. I had been having trouble with my balance for a few months. I would suddenly tip to one side, stagger a couple of steps every now and then, bang into door frames and even run into people when walking past them. Now I knew why. I had an alien in my head! It was about the size and shape of a jelly bean, and it was putting pressure on the eighth cranial nerve, preventing most of the sound that hit my eardrum from reaching my brain. It was also why I kept losing my balance. While doctors insist this is not one of the symptoms, another problem I was having was with my typing. As a journalist with well over 20 years of experience, typing was essential, but in a few months, I had gone from being a very clean typist with few errors to producing copy that was full of mistakes. And not just typos, either. Weird errors were creeping in — wrong locations, wrong names, wrong dates, the sorts of errors I just hadn't made before. When I changed the location of a meeting to an entirely different town in one story and switched mayors in another, I knew I was in real trouble. It was frightening. However, after I joined an on-line group hosted by the Acoustic Neuroma Association of Canada (ANAC) for people with acoustic neuromas, I discovered that this was a very common problem. Other people who previously had no problems writing and typing were having trouble with these skills, just like I was. Regardless of what the doctors said, these mistakes somehow seemed to be related to the presence of this kind of tumor. So, what next? Doing nothing wasn't an option, since it was already having a serious impact on my job and my life. It wasn't cancerous, but it certainly wasn't benign in other ways! Clearly, I needed to do something. One option was 12 hours of brain surgery to physically remove the tumor, with me remaining awake throughout. I would be left with a total hearing loss on one side and almost certainly some paralysis and loss of sensation in that side of my face. I ruled that out immediately. There were two other treatments available, both using radiosurgery in which the tumor would be blasted with highly concentrated beams of radiation. I was extremely lucky to discover that a brand new gamma knife centre, the first one in Ontario, had opened at Toronto Western Hospital the same month that I was diagnosed. It was only about 70 minutes' drive from my home. After more consultations with other specialists, more brain scans (which proved hard on my dental fillings, several of which cracked afterward), I was scheduled for treatment in March 2006, just six months after my first meeting with the doctor, at the Joey & Toby Tanenbaum Family Gamma Knife Centre at Toronto Western. A Leskell Gamma Knife radiation unit. You know how people say someone has a screw loose, or has holes in his or her head? I can now lay claim to both! Gamma knife surgery involves aiming 201 beams of gamma radiation precisely onto the tumor. To achieve this, the patient's head must be held very still and in an exact location within the machine. A metal or plastic frame (mine was metal) is screwed directly onto the skull, with two screw in the temple area and two behind the head. A large helmet is then attached to the frame. Next, the patient lies down with the head inside the gamma knife machine, and the bed portion moves forward and back as the beams are directed into the exact spot where the tumor is. The entire procedure from entering the hospital until discharge is only about five or six hours. The hardest part for me was being unable to wear my glasses, so everything more than a foot away from my face was just a giant blur for the entire time. For me, having the screws put in my head was painless. So was the actual operation, although the jerking back and forth was rather unpleasant for my neck. But getting the screws removed after the procedure was completed was a whole different situation. The sudden change in pressure on the skull triggered an immediate, wicked headache and nausea. I ended up on an IV containing some kind of painkiller and anti-nausea medication. After an hour or so, I was quite literally feeling no pain! The drive home was interesting (yes, I had a volunteer driver) because I was pretty high from the combination of whatever I had been given. It didn't last long. By midnight, I had the mother of all headaches. It was to last several days, but gradually tapered off to a mere annoyance. I was back to work about a week later. It would have been sooner had the headache not been so severe. I have had several more MRIs and CAT scans over the past few years. The last one showed that the tumor had not grown. In fact, it had shrunk a bit. That was an excellent outcome. In the years since my surgery, my typing skills have gradually improved, although they never returned to what they had been before the tumor started affecting me. My hearing has continued to worsen, and I am now almost completely deaf in my left ear. I also can't tell where a sound is coming from because it is only being heard on one side. Since the cranial nerve that carries sound from the affected ear to the brain is blocked, a hearing aid will not help, but that's okay. The tinnitis has increased, but usually it only bothers me when I am trying to fall asleep. It seems to be loudest then and when I wake up in the morning, but during the day it is easy to block it out, since it has remained a kind of "white noise" rather than the irritating loud ringing that many people with AN suffer from. My balance overall is better now, and I don't tip or stagger nearly as often as I did before my surgery. But if I do start to tip, I cannot recover my balance, and I fall. I probably average five or six falls a year, and I've learned to just relax and let it happen. So far, I haven't broken anything (fingers crossed), but I have sported some spectacular bruises on my left arm quite a few times, since I always fall to the left, the side with the tumor. If I go underwater while swimming, I can't tell up from down anymore, so I have to be very careful. I just hope the police never stop me for a sobriety check because, despite being a non-drinker, there is no way that I could do the walking-heel-to-toe test without falling over. I was fortunate to be a Canadian living in Canada. Because of this, I did not have to pay for any of the consultations, scans, operation or follow-up visits. 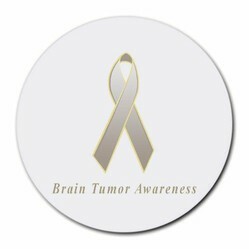 Having a brain tumor is certainly no fun, but every day I am very thankful that my tumor wasn't cancerous. I am proof that having an alien living in your head is not the end of the world. After my comment on your other page, I found this one. Yes! This is what my son chose to do also. The surgery would have been very difficult and dangerous because his tumor was wrapped around a large vein. His wife sent me a photo of him in this type of headgear you show here. It's wonderful there are such advancements to offer this type of treatment. And lucky you to not have a huge bill afterward. Wow, you had to endure a lot. I'm so glad you were able to get treatment and are doing well now.